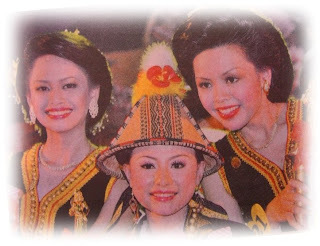 Tell you, I was not there on the final day (31st May) of the month-long Kaamatan celebration, so, no story to tell and no pics to share. Hongkod Koisaan KDCA was so crowded all day on the 30th, and in the night there was concert and all kind of other activities. I guess that would be it and I do not have to attend the 31st day closing ceremony which normally be just formality and capped by the crowning of the final winner of Unduk Ngadau Kaamatan. I can, however, share with you the front page stories of all the major local dailies. And, your guess is correct, they are all about the Harvest Queen and stories related to Harvest Festival. 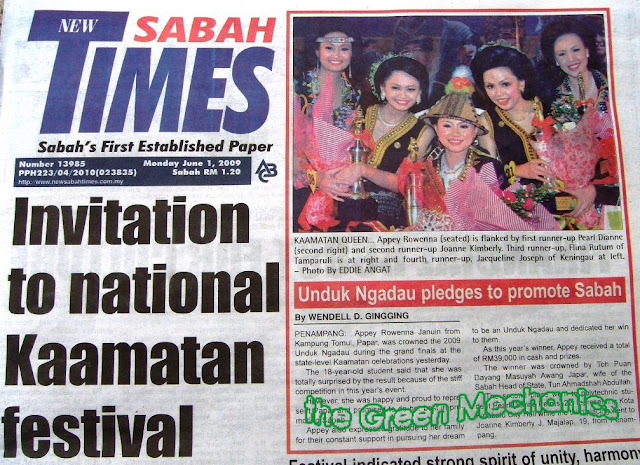 New Sabah Times talks about Chief Minister Datuk Musa Hj Aman's open invitation to all Malaysians especially those residing in Sabah to join the national Pesta Kaamatan celebration in Kota Kinabalu on June 7. Note the top five contestants of the Unduk Ngadau. 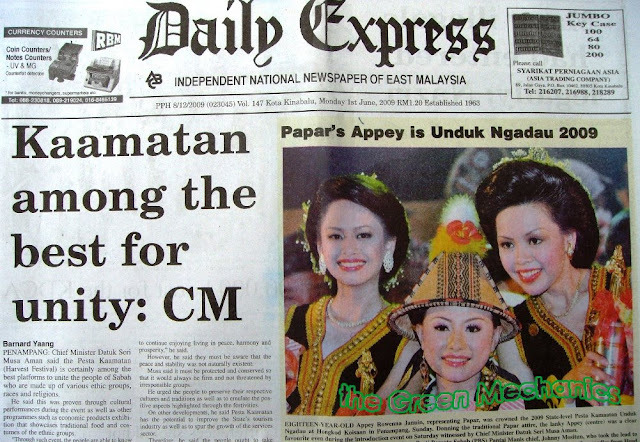 Daily Express - says that Pesta Kaamatan is certain to be "among the best platforms to unite the people of Sabah who are made up of various ethnic groups, races, and religions." Note the three lovely winners. UNK 2009 Ms Appey Rowenna Januin is flanked by 1st runner-up, Ms Pearl Dianne Petrus (right) and 2nd runner-up, Ms Joanne Kimberly J. Majalap (left). 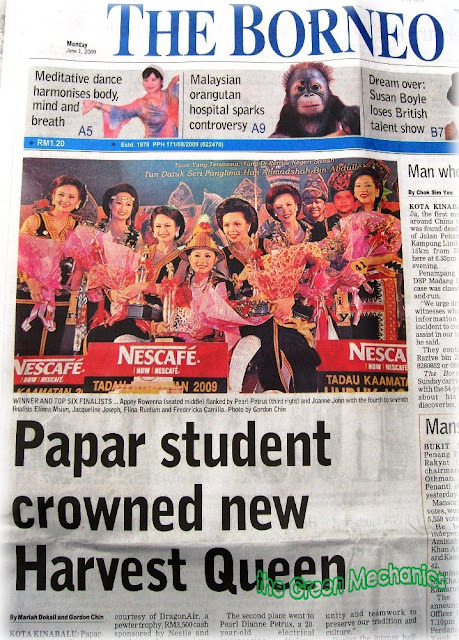 The Borneo Post - focuses its front page story on the winning Unduk Ngadau Kaamatan. Congratulations Girls! 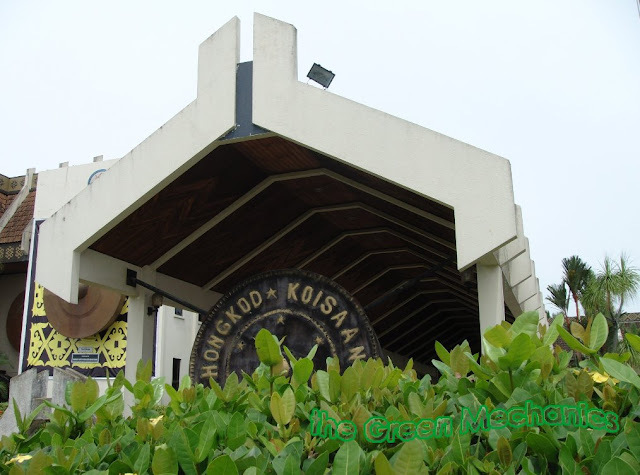 and Kotobian Tadau Tagazo Do Kaamatan! heppi Kaamatan to u too & everyone celebrating it! let's keep the celebration in moderation.